It was February 2016 I stumbled out of our red Prius rental car and shuffled my legs across the icy ground. Everyone looked in much better shape than me. But less than 24 hours earlier I was deep in the woods of the Alaska wilderness running. The Susitna 100 was an epic 100 miler race across frozen Alaska. This year it only saw 28 runners actually finish. Of those finishers only 9 were females. Karen Johansen was one of those 9 females and so was I. At the award ceremony the next day she looked almost completely recovered while I stayed firmly in my seat trying to hide my obvious limp. I didn’t know much about Karen at the time other than that around mile 40 her and her friend Lourdes effortlessly floated by me at my lowest of lows. We all chatted about the race, our up coming races, and where we were from. This is how Karen and I connected on the Western States 100. Excitedly she asked if I would pace her and even more excited I obliged. It is now June 2016 and the hype for the Western States 100 was growing in Tahoe. Karen had a super limited schedule so we barely got to sync up before race day. It was Friday afternoon when we finally saw each other 5 months since our last chat in person in Alaska. Karen was super sick. She could barely sit with us for more than a few minutes before getting nauseous. We made a plan to have me pace her the whole way from Forresthill to the finish and then she went to bed. I started to feel nervous about her health and the heat of the coming day but if I knew anything about Karen it was that she was one tough cookie. I decided to pass the time by going paragliding which proved to be a mildly bad idea. I stalled my paraglider close to the ground and fell right on my ankle. A sprained ankle the day before an ultra. I knew this wasn’t going to be easy. By the time I woke the next morning Karen was already at mile 10. I continued to watch her tracker like a hawk. She was averaging a good pace and I started to estimate when I would need to be in Forresthill. By the time she reached mile 30 I had a good estimate of when she would be at mile 60. It started to dawn on me that I would be running for some very strange hours. Entirely all at night. I quick grabbed another nap and headed down the hill. I kept massaging my ankle just hoping it wouldn’t cause me any problems. I put on my running clothes, packed up my backpack, and put on my compression socks in an effort to combat the swelling in my ankle. The sun was setting already and I was feeling super mentally unprepared for what the night was about to hold. I kept reminding myself that Karen had 60 miles on her legs and I had 0. This isn’t about me. This is about her. 40 miles on fresh legs is nothing. By 9pm all of the spectators started to go to bed and clear the streets. It was dark now so I put on a jacket because I was cold. I said goodbye to some people and then it was just me standing waiting. Karen rolled through the aid station around 9:45pm and we were off running together at 10pm. I had already shed my jacket as we ran down the street together chatting. I couldn’t believe how fresh Karen looked! Distracted we missed the turn straight out the gate and some people behind us yelled for us to turn. Wow that could have been bad I thought as I cleared my head and focused. The course wasn’t as well marked as I thought it would be so I made extra sure to always be looking… I mean we all had heard what happened to the number one guy getting lost before HWY 49. Before even getting a mile into the run we both had to use the bathroom. We cleaned up and continued downhill. It was a lot of downhill. I thought we were making really good time. We were talking about running, our personal lives, and everything in between. The first aid station came and went and I was back on familiar trails. I had worked the Cal 2 aid station for the Canyons 100k so I felt a little less lost in the woods. I couldn’t believe how dusty and hot it was for how late at night. We made it to the Cal 2 aid station were everything was buzzing. We saw a few people who had dropped and ate a little food. By this point we had finally settled into together. We had tried Karen running in front and me following and vice versa but settled in with me leading and setting the pace. We reached the next aid station quickly and everyone couldn’t believe how great Karen looked. I really lucked out. She was so strong and good at running ultras. She knew exactly what she needed when she needed it. As we left that aid station we started to go uphill again. Karen is a really strong ascender even with 70 miles on her legs. We set a really solid pace on the uphill and passed several parties that looked like they were hurting. The next stop was the river crossing and I was getting nervous about the prospect of the fridge water at 3 in the morning. The river came faster than expected and Karen flew through the aid station before the water. A spectator grabbed me by the arm and said Jen!! what are you doing here?? Immediately confused she realized I was not Jen Shelton. This wasn’t my first time being mistaken for Jen. We both laughed as she continued to rant about how I could be her sister. Karen was already at the river as I sprinted down the stairs to catch up. They put a life jacket on both of us and it was time to go. We waded waste deep across the river making sure not to twist an ankle on the slippery big rocks below. This was a first for both of us. The water was cool, welcoming, and refreshing! I was feeling revitalized and ready to take on the rest of the course. Karen took her shoes off to realize what she thought was a rock was actually bad trench foot. She changed her socks, but the damage was already done. She knew she just needed to grit it out. We went up hill for the next mile or so and the heat had already dried most of me out. We were at mile 80 now and we had a small 20 miles left to go. The trail goes down hill for a bit and then turns into a very runnable angle. We capitalized on this and set a slow but steady pace. We passed a young man who was really hurting. His cough echoed through the canyon. I kept thinking how lucky I was that Karen was in such good shape! I turned around and asked her how she was doing again. She responded with the usual good! Though I knew she had terrible trench feet, 80 miles on her legs, and horrible chaffing. The strength of an ultra runner is insane. We ran with in close distance of this young man and his pacer for awhile and had to listen to the awfulness of his pacer. Sometimes its better to let the struggler struggle and encourage them instead of being so hard. Karen and I shot each other a glance and pulled away from hearing distance. I refilled my water and fueled up at the next aid station. My hand flashlight battery was dead so I pulled my spare headlamp from my pack. The sun was just barely rising. But it was dark enough to need a light. We were roughly a half marathon from the finish. We wanted to cover as much distance as possible before the sun hit us and slowed us down. Then it hit me… the gut rot. It was only 3 miles to the next aid station I could make it. I trotted along the trail in fear of shitting my pants. All of my energy and thoughts were consumed by keeping it together. Out of no where my friend Chaz chipper as ever came flying by. When did we pass Chaz I thought? He had come through Forresthill in the day light!! I was super happy to see he was still going and hadn’t lost his sense of humor. The aid station came faster than expected and I disappeared into the portapotty. I made it quick and found Karen on her way out of the aid station. It was a quick section to HWY 49 and then we would be in the home stretch. The sun had risen and it was already smolderingly hot. This was my lowest point. I was sick. My hips were hurting still from the Broken Arrow Skyrace the previous weekend. I was over 30 miles in. Karen was going to finish whether I was there or not. She was doing so good. I contemplated stopping at HWY 49 and getting Corbin to pick me up. It wasn’t like I was racing. Crippled over on the uphill Karen still looking strong she knew I was hurting. I joked doesn’t it feel good to see someone with less miles on there legs hurting worse than you? She laughed and said kind of. We both laughed and I started moving a little better. This is when I realized what made pacing hard. It’s the motivation. When you’re racing you get your motivation from the belt buckle, from the finish line, from the idea of crossing something off your list. I didn’t have these motivations. What was it that I could draw on to keep moving? It was Karen. It was getting to see her succeed. It was getting to share in her accomplishment. It was getting to make sure she finished. I told her I’d run with her to the finish. I was running to the finish. We could feel the energy of the finish line when we reached HWY 49. Everyone was screaming and cheering. We were a short 6 miles from being able to close our eyes and sleep forever. I knew all of these trails I had run them before. Karen wanted to run so we ran. Even on the uphill. By the time we reached the no hands bridge which was the second to the last aid station a sense of relief came over us. Karen was finishing this race. There were no cutoffs left to miss and just a short 3 miles and a big up hill between us and the finish line. I runner came up behind and me and said hey Jen it’s Blah Blah from race Blah Blah remember me? At this point I just said it’s so good see you again! And Karen and I left the aid station. Karen laughed and looked at me and said wow I bet everyone is wondering why a professional runner is pacing me. Karen started to become teary eyed as the prospect of finishing this race became more and more a reality. I quick grabbed the phone and turned it to full speaker on some jams. We were walking up this hill and we were going to do it in musical style. We passed a few people and got passed by a few people and after the final aid station we started to run again. Less than a mile from the finish I couldn’t contain my excitement. I was screaming and clapping and cheering and maybe dropping the F-bomb more than I should have. As we hit the pavement and ran through the neighborhoods of Auburn, Karen and I started to belt the lyrics to the song playing. Right now the name of the song escapes me but this moment was really special to me. Karen had been awake for 28 hours, had 100 miles on her legs, and was so happy and alive! The track came into view and I handed my phone off to my friend Lucas to take photos of us finishing. I looked at Karen and she said run the track with me. We ran the entirety of the track and as the finish line got closer and closer I didn’t want it to end. And just like that it was over. She had did it. And no one can ever take that away from her. She will always be a Western States 100 finisher! We laid on the track drank some water and parted ways. 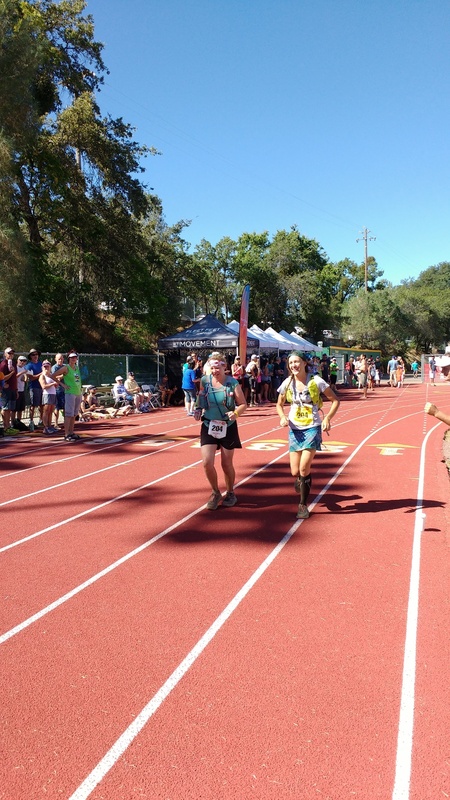 To me pacing the Western States felt more rich and more meaningful than any race I’ve ever done. There’s no doping, no cutting course, no glory, no finish line, the selfishness that has made me hate running sometimes was stripped away. It truly made me appreciate what Tim had done for me in Alaska. He could have finished 5 hours faster but he stuck with me. He stuck with me and made sure I finished too. The selflessness in these serious endurance events makes me really love the people I choose to call friends.